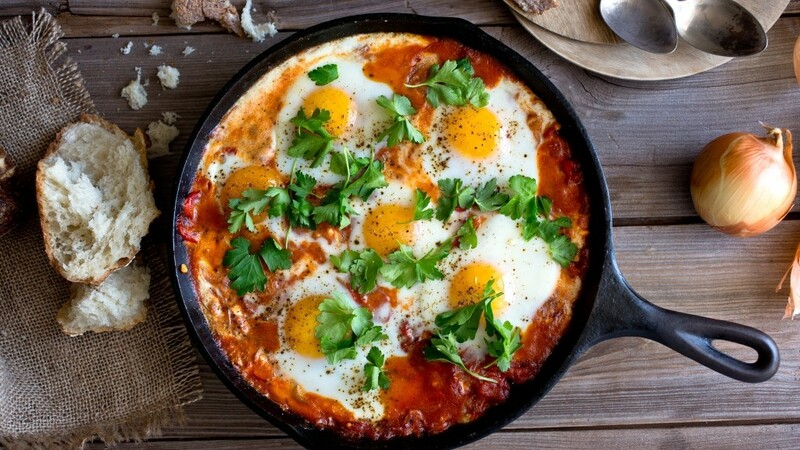 Shakshuka is my absolute favourite breakfast, made up of a spicy tomato and pepper stew with poached eggs. I’m a massive fan of eggs as they provide a quality source of protein and many nutrients including vitamin D and selenium which food surveys suggest may be lacking in many people’s diets. This dish also makes a great vegetarian supper that you can bulk up by serving with chunks of wholemeal bread. If you’re avoiding wheat or watching your carbs then try adding a handful of black beans to the stew. Heat up the oil and add the fennel seeds cooking for 1 minute. Add in the onion, garlic and cook for another 3 minutes. Add in the peppers, spices, tomatoes, salt and pepper. Cook for 25 minutes until the peppers are soft (you will need to add more water as you go). Make small wells in the tomato sauce and drop in the eggs then put the lid on and cook for 5 minutes until the whites of the egg are cooked. Serve with spinach or wholemeal toast. This dish also looks cool when you cook each portion separately and serve in small skillet pans. This entry was posted in Breakfast and tagged eggs, fennel, paprika, peppers, saffron, shakshouka, shakshuka. Bookmark the permalink.